Topmost Herb Farm was born in the late 1980s as a wholesale supplier of certified organic medicinal herbs to small companies producing herbal medicines. Markets change as does the economy and a bit of reinventing has been necessary over the years. Organic certification was surrendered some years ago, but the practice has never ended. The fields, lawns, gardens and greenhouse have never been exposed to commercial fertilizers or pesticides, as it has been since my grandfather’s time. Certified organic potting mix comes from Millerton, New York yearly as part of a bulk order. Compost is generated here and used liberally in the gardens. During open season at the greenhouse, customers are encouraged to taste the leave of the herb plants, as well as those in the gardens. The period saltbox house was originally built in 1749, purchased from the state of Connecticut, dismantled and rebuilt here. The greenhouse collapsed under the weight of snow in 2011. 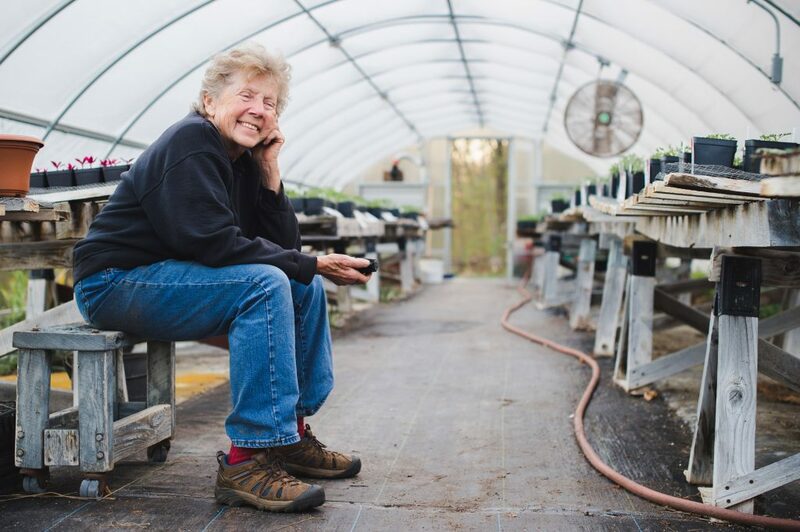 With an amazing outpouring of help from the community, committee members and vendors of the Coventry Regional Farmers’ Market and numerous strangers it rose anew to meet the growing season the following spring. In usual hindsight fashion, dead man poles are now installed each fall to support the metal hoops for the winter. My son travels from Colorado to take care of this task, along with cutting my winter wood supply. Local dairy farmers often bring their heavy equipment to clear away heavy snowfall that threatens the greenhouse. I am constantly in awe of the blessings that Topmost receives. 9:00 am to 5:00 pm on Friday, Saturday and Sunday May/June. We will reopen on Friday, May 3, 2019.